Dr. Morrow had already built the dock of his dreams…twice. The dock in St. Petersburg, Florida, succumbed once to shipworm damage and once to storms. Before rebuilding a third time, the surgeon decided he would handle things differently this time. Dr. Morrow explored possible preventative measures. As he learned, his options were limited. Metal sheathing surrounding each piling is always costly and can prove ineffectual due to corrosion. Cement casings crack under the pressure and plastic and fiberglass coatings only cover up the problem. With, plastic dip, he reasoned, “all it takes is one boat rubbing up against it,” and the seal would be rendered useless and the cost of plastic wrapped pilings. Pumping the piling full of chemicals can temporarily slow the worm infestation, but Morrow was looking for a permanent solution. Building another wooden dock would be tantamount to throwing good money after bad. So he did some research and came across Pearson fiberglass pilings. He reached out to Pearson Pilings and, as often happens at the family-owned business, he ended up dealing directly with Mark Pearson, Pearson president and CEO. “Mark was great.” From architectural advice to help with shipping and installation, Mark and his team offered support and expert insight to ensure a seamless delivery and successful rebuild. “Dr. Morrow inquired regarding his dock and lift project. He wanted to make it as indestructible as possible,” remembers C-Scape Construction president, Scott Mclellan. 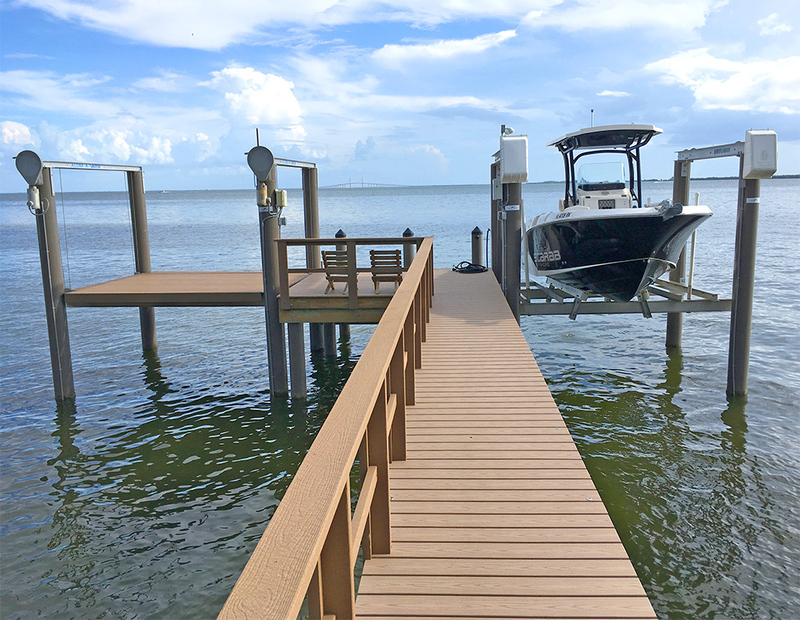 “After rebuilding twice, “he didn’t want to be rebuilding this project again!” C-scape Construction used Pearson Pilings fiberglass composite pilings to rebuild the dock to prevent further marine wood borer damage. As Mclellan notes, “I had already looked into the pilings.” Liking the option of “not having to deal with the shipworms since they are impenetrable to those.” When it come to Pearson Pilings, explains Mclellan, “almost nothing can hurt them. It’s just a matter of making them affordable in the project.” While Pearson Pilings add value over time, the initial investment leads some contractors to cut corners and opt for cheaper alternatives. Mclellan knew that for this project, composite pilings were the right choice. “When you replace a piling three times, it gets to be where the cost is balanced,” he reasoned, since Morrow would have saved himself the cost of rebuilding twice if he had used Pearson fiberglass composite pilings in the first place. Located in Florida, C-Scape Construction has built a reputation for constructing dependable seawalls, docks and decks. Specialists in vinyl, composite and other alternative technologies and materials, their expertise helped guide the speedy reconstruction. Together, Morrow, Pearson and C-Scape collaborated on the rebuild and their efforts created a coastal showpiece that will last generations. “Ultimately everyone has to decide if it will work for them,” says homeowner Morrow on his decision to use Pearson’s premium product to construct a dock that will last a lifetime. “It’s your choice. Do you want nicer stuff that will last longer instead of disposable?” Morrow opted for the premium choice and he’s elated by the results. Looking for a smart, environmentally friendly solution for your waterfront project? Discover the power of composites. When you replace a piling three times, it gets to be where the cost is balanced... It’s your choice. Do you want nicer stuff that will last longer instead of disposable?